Creating Colored Pencil Art? Claim this FREE Download! Each of us come to art for different reasons. Some of the most common include the need to express ourselves and the desire to create memories of the things, people and places we experience. It’s freeing to be able to stop what you’re doing anywhere and sketch a scene or put a new idea to paper while it’s fresh in your mind. While painting is satisfying, carrying all the supplies you need on a daily basis takes planning and can be cumbersome. Color pencil drawing, on the other hand, keeps it simple. Paper, pencils, a sharpener and eraser are the basics that you need; all of which can easily fit in a backpack or satchel. LEARN ABOUT COLORED PENCIL TECHNIQUES IN THIS FREE DOWNLOAD! “Colored pencils are relatively inexpensive and the palette is extensive. The color is pure, clean and bright. The medium is permanent, and colored pencil drawings do not require elaborate care or storage. Along with hard and soft colored pencils, watercolor pencils and oil-based colored pencils offer more options for beginning artists. The process for using colored pencils isn’t as obvious as one may think. There are many colored pencil techniques—don’t start without knowing how to get the best results from your supplies. In Colored Pencil 101 (a free excerpt from The Ultimate Guide to Colored Pencil), you’ll learn how to use the two types of strokes that work best for colored pencil painting, how to follow contours to show the shape of a surface, how to gradually add color and how to keep your color from becoming contaminated. Greene shows you how to work from dark to light, create highlights, make adjustments and keep things as clean as possible to protect your final painting. Plus, along with this free download from The Ultimate Guide to Colored Pencil, you’ll receive the free ArtistsNetwork.com newsletter with inspiration for painting with watercolor, oil, pastel, acrylic, and of course, colored pencil! 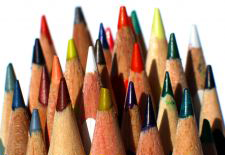 In Colored Pencil 101, you’ll gain an understanding of how to use colored pencils and apply a variety of techniques to your own paper. Give yourself this helpful knowledge that will move you closer to getting the artistic results you want for your own drawings and paintings. Learn why it’s important to follow the contours of your subject’s shapes to give a realistic impression. Discover how to add color gradually so that you don’t lose the naturally translucent character of your colored pencils on the paper. At some point in any given painting, you’ll want to make adjustments. In this free download, Greene explains the difference between adjusting wax or oil-based colored pencil marks as opposed to adjusting water-soluble colored pencil marks, as well as what happens when you use a solvent. You didn’t pick up your colored pencils to get frustrated. Having the advice and knowing these tips from Colored Pencil Art 101 will ensure that your colored pencil experience will start out positive because you’ll have all the basic information you need to create a colored pencil painting, and you’ll enjoy the process along the way.